New research may indicate a bit of good news for the Da Vinci Surgical System. A study published by the Journal of Endourology indicates that surgeons may be able to reduce the risk of a ureteral injury during robotic prostatectomies. Good news for Da Vinci? This research was conducted at the Henry Ford’s Vattikuti Urology Institute and involved nearly 6,500 patients. All of these patients had undergone a robotic-assisted laparoscopic prostatectomy between January 2001 and June 2013, performed by one of five surgeons. 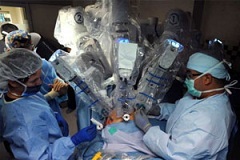 In addition to various complications reported, three of the patients were noted to have sustained injuries to the ureter during the robotic surgery by two of the five surgeons. These surgeons were well trained, logging more than 1,000 procedures using a robot. One of the patients needed additional surgery after suffering the ureter damage. In June of this year, we told you that a new report suggested that a number of serious and potentially life-threatening complications from robotic surgery may be avoidable with the use of a simple safety checklist, before and during an operation. Perhaps focusing on risk factors and utilizing safety checklists may reduce the mounting complaints, perhaps not. One thing for sure is that injury complaints are increasing at an alarming rate. In 2013 alone, the FDA has received at least 3,697 Da Vinci complaints – this up from 1,595 received in 2012. Complaints range from the lack of training that surgeons performing the procedure have had to concerns over the defective design of the machine, and from inadequate warnings to faulty equipment. Hopefully the increased awareness of the growing problem will result in an increase of training for surgeons. Da Vinci robotic surgery is not all bad. No one – at least not me – is suggesting that the product should be withdrawn from the market. But this product has had problems and will continue to have problems until they start using it in the carefully delineated circumstances as opposed to a catch-all that is appropriate in every surgical situation imaginable. If you believe that you or a loved one has been injured as the result of a Da Vinci robotic surgery, we can help you. Call us toll-free at 1.800.553.8083 or contact us here.